It has been slow but steady going…One strip at a time. 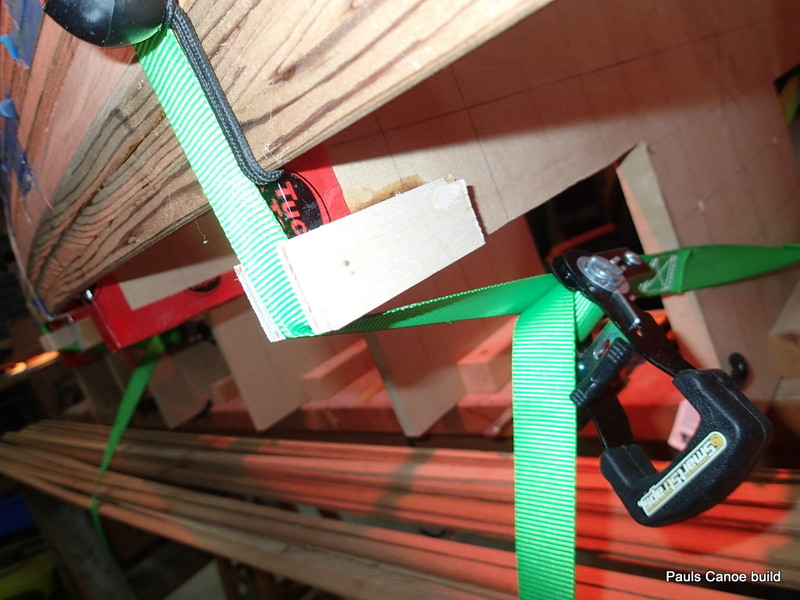 11 strips on… I am using a piece of aluminum angle iron to increase friction for the bow clamp. To make putting the clamps on easier, I glue the angle iron to the squeeze clamps for the stems. 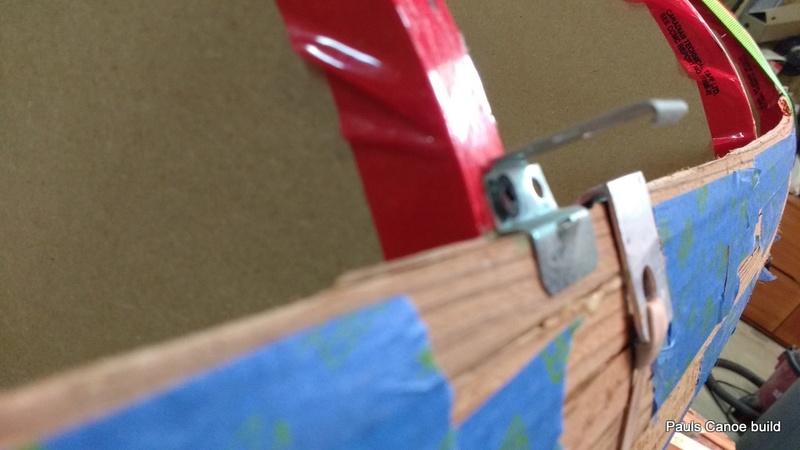 Aluminum angle iron glued onto the squeeze clamps. I was at “Wooden Boat Alley”, the Vancouver Wooden Boat Society booth at the Vancouver International Boat Show. Did not get any strips on from Wednesday through Monday. 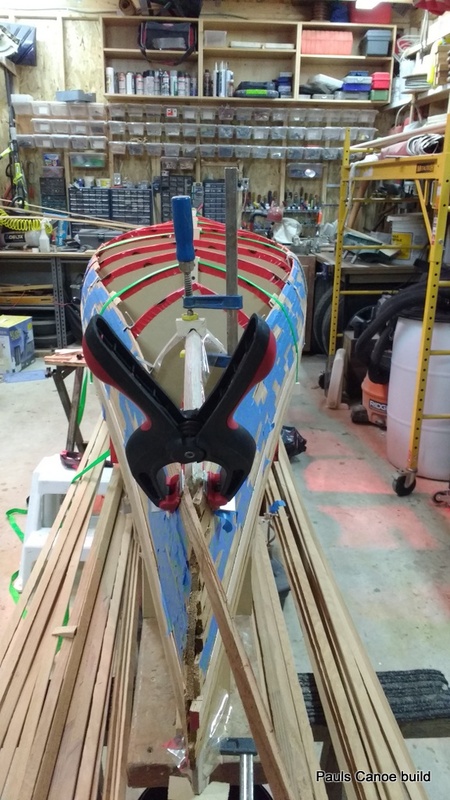 Because we are at the turn of the hull, the strips have a lot of twist in them. 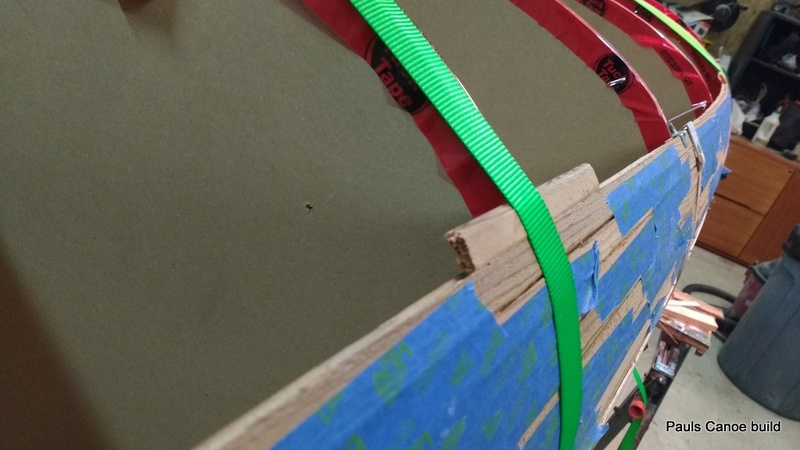 Where necessary, we use bungees to hold the strips together, as well as tape and hot-melt glueing them to the forms. 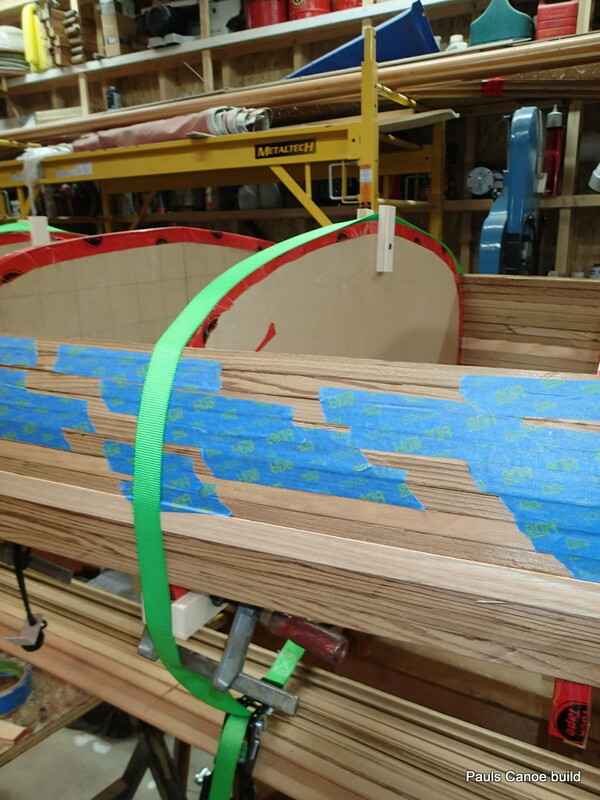 We are having an increasingly hard time getting the strips to bend to the forms. 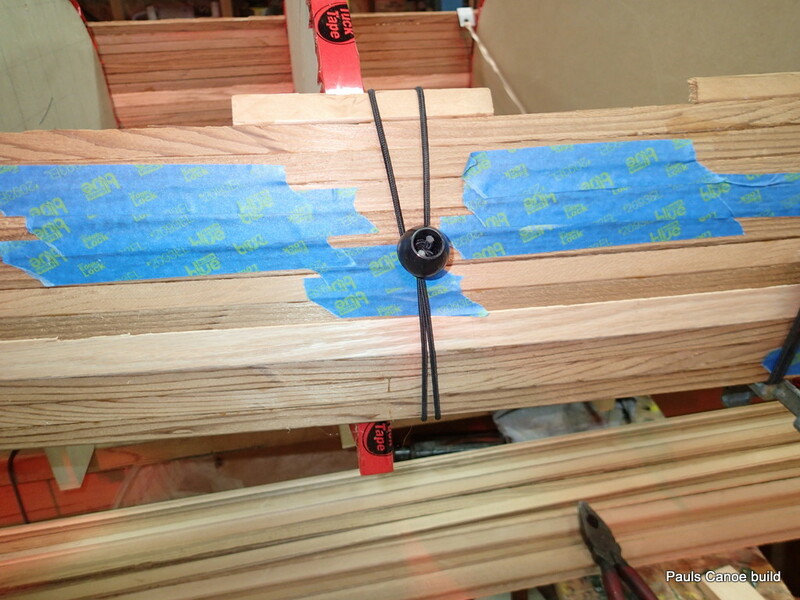 We hatch another plan…Using ratchet straps to hold the strips to the forms. I buy four ratchet straps and adapt the forms to hold the straps in position. 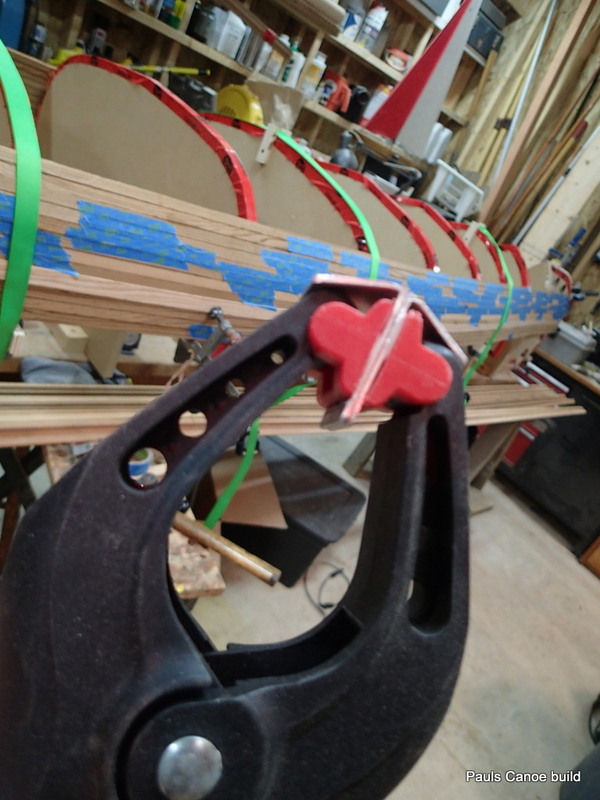 Glueing the guide blocks for the ratchet straps on forms. 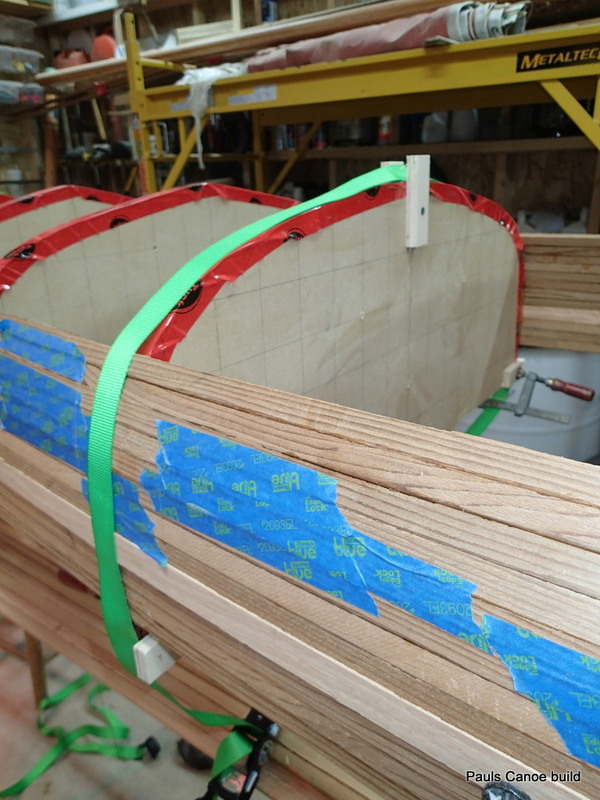 I glue six guide blocks onto four of the forms, one at the bottom on each side and on at the keel line. 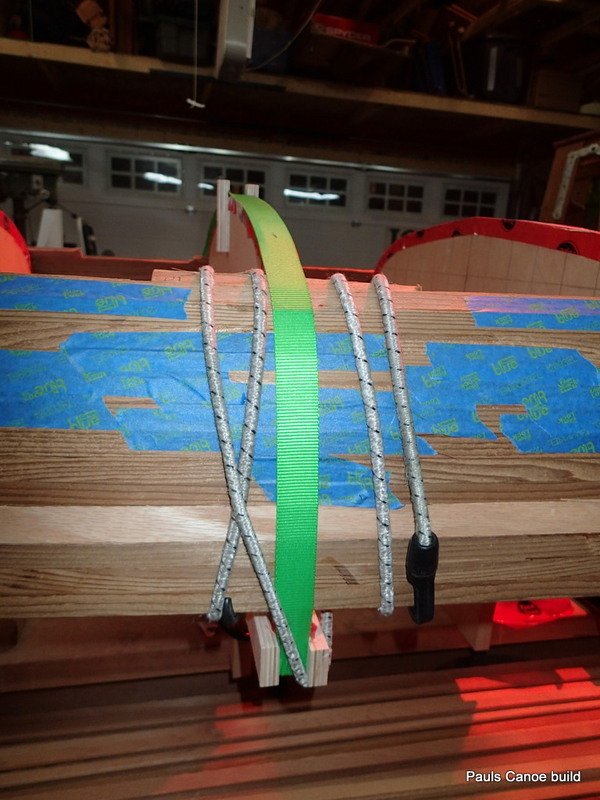 We want the straps to pull the strips tightly to the form, and the guide blocks keep the strap along the form. I let the guide blocks dry overnight. 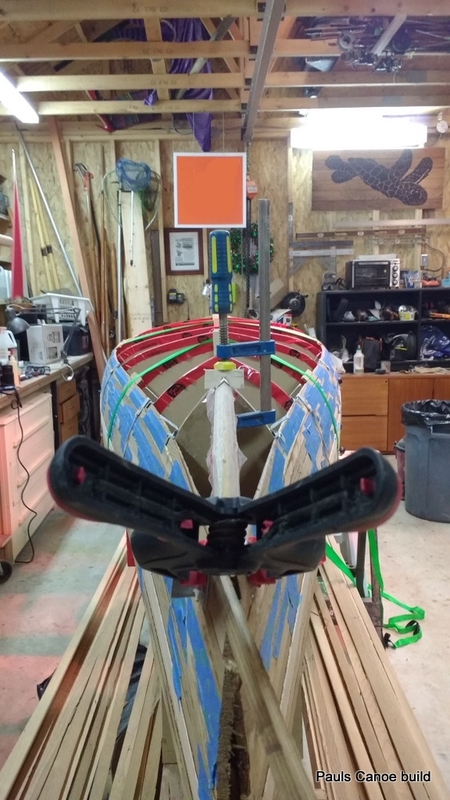 I do not glue on the keel blocks. We use bungee cords to hold the strips together. 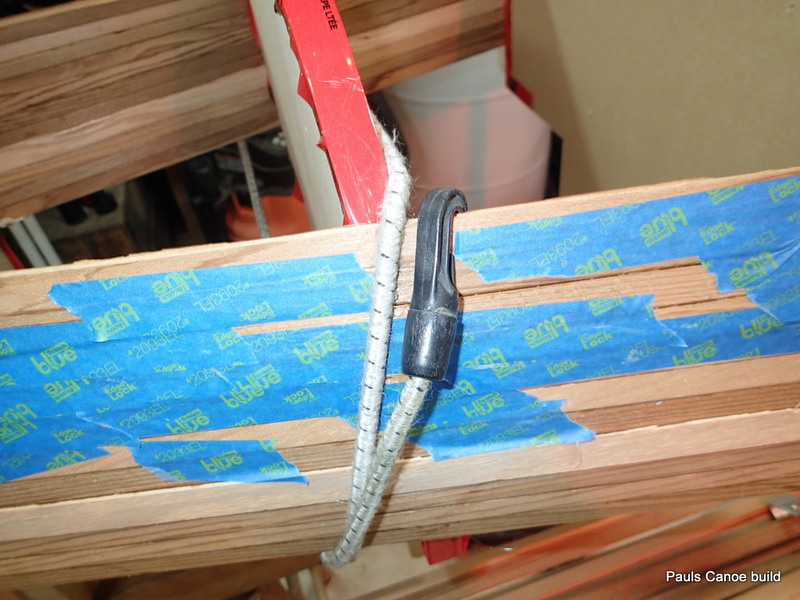 Paul and I add another strip, this time using the ratchet straps and the guide blocks. 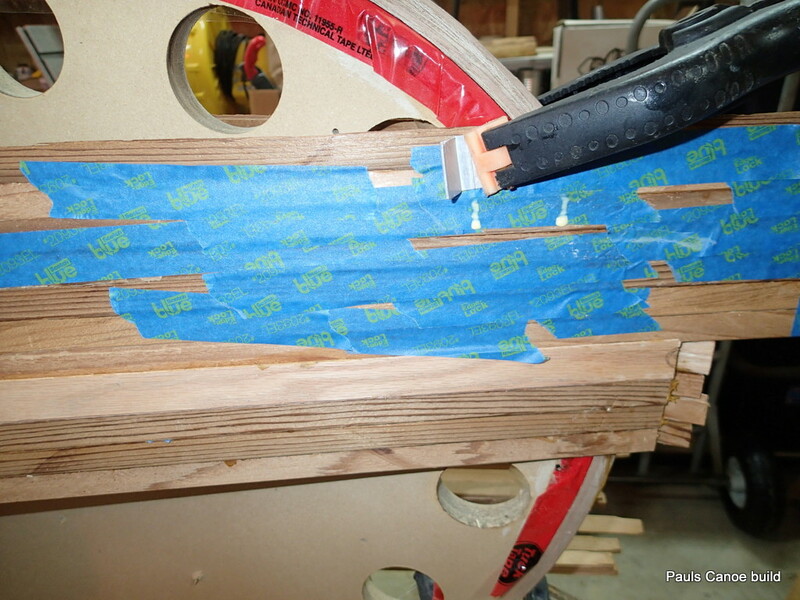 A “Pusher” block helps hold the strip in place. 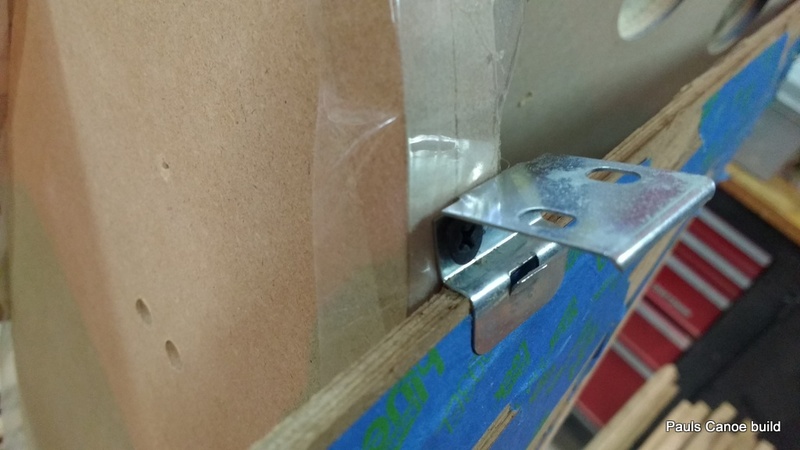 I find some old slat-blind brackets that we can use to hold the strips in place. Screw-in bracket to hold strip in position. We push the strip down onto the strip below it and then screw in the brackets to hold them. We also tape all the strips together. We also use the “J” hooks to hold the strips together. 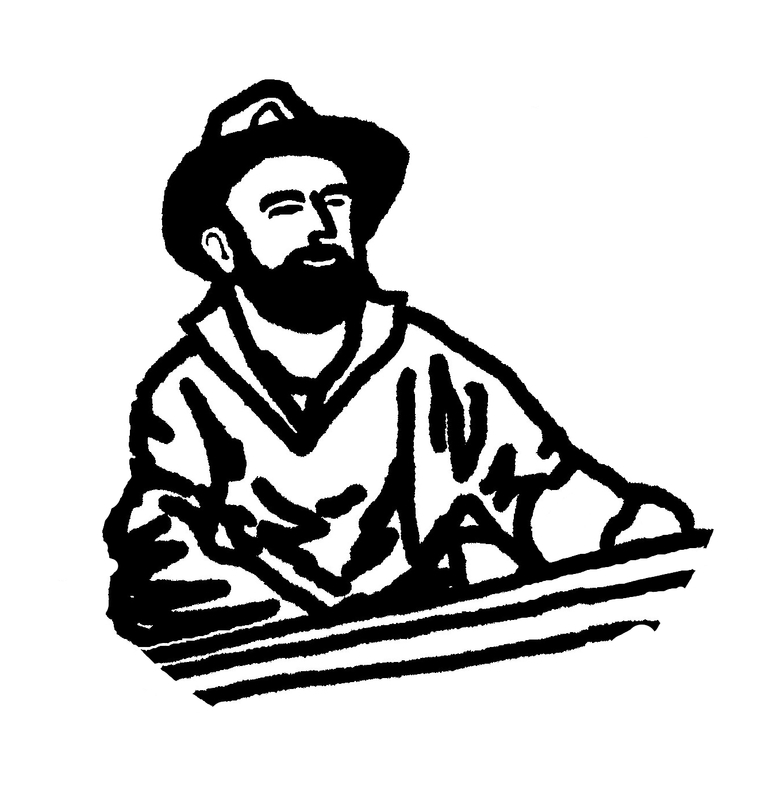 North-South view of the canoe. Look’n good!!! The straps are pulling the strips onto the forms. South-North View. The shape looks good! The ratchet straps are very tight. The ratchet straps are very tight; they bring the strips to the correct angle, following the shape of the forms. The height from the floor to the top of the strips is within ⅛” on each side. Very even, all things considered. Ratchet strap, bungee and tape in action. We have 18 strips a side left, at this rate done by Pancake Tuesday!!! !